Completely redesigned with 3 bedrooms and 4 full baths. OUR MOST POPULAR beachfront villa! If you are looking for the perfect beachfront villa look no details were spared in the preparation of this vacation home. Awnings, luxury kitchen, high quality bedding, flat screen TVs, WIFI internet and direct beach access!!! This villa features two master suites, each with a king bed and fully renovated private bath. with double granite vanities and large custom tile showers. The third bedroom has two queen beds with high quality Beauty Rest mattresses with memory foam top built in for extra comfort and a private bath with tub/shower and custom tile. There is a fourth full bath in the hall for convenience. The luxury kitchen is quite spacious with tons of counter space and storage. Enjoy a personal wine cooler and cook great meals with the GE Profile stainless steel appliances. Each bedroom enjoys a flat screen TV and private bath. The living area also offers a stereo with IPOD dock and DVD player for family enjoyment. With two large sofas and club chairs there is plenty of really comfortable seating for relaxing after a fun day of outdoor activity. 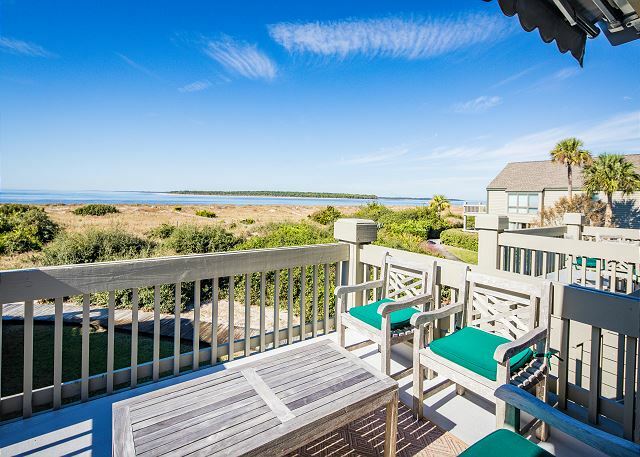 Walk to the Seabrook Island Beach club, golf and dining. Your amenity cards are FREE and included with your stay. Free wireless internet access is provided for guests too. 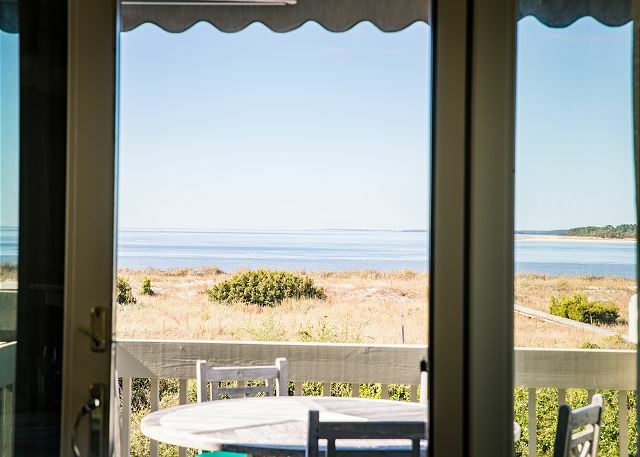 Direct beach access, two deck awnings and panoramic views too! BOOK NOW THIS PROPERTY FILLS FAST. We love Seabrook and this villa!! What an amazing week we had! We have stayed in this villa before and just love it. Kitchen is well stocked and the view is amazing! Sunsets, walks on the beach, time on the desks and enjoying the beautiful setting inside and out....dream vacation! We were an extended family of 7 from across the country. We like to cook and this kitchen was perfectly stocked. 4 bathrooms made a big difference. Retractable awnings made the outdoor spaces additional rooms for watching the sunsets and wild storms that blew through. This was our second vacation in this villa and we'll be back. We have rented this place before. As before this an awesome vacation. The place was clean and very inviting. We love it. Close to the beach and the condo had everything in it that we needed. We will definitely be back next year at this place. We love Seabrook Island and have been coming here for over 20 years. Love it. Absolutely great location and the home was perfect in every way! Excellent communication from the very beginning including follow up towards the end of the stay. Rented this unit for a vacation in late September. Weather was awesome, location was great, and it wasn't very busy. Spent some time at the beach and the club pools, both were great. Wonderful. Loved 1388 Pelican Watch and Seabrook Island. The view was great. This beautiful villa is very conducive for relaxing and fellowship! Enjoyed the lovely furnishings and gorgeous view. Every bit as good as promised. One problem was a very poor mattress in a front bedroom. But other than that everything was perfect. Our fourth visit to this villa! We must love it or we wouldn't keep returning. Nicely furnished with a great location/views. Have already booked our return for next year. We have rented several Pelican Watch Villa's over the years, but nothing quite like this one. It is a true 3 bedroom, 4 full bath unit. Double deck, with beautiful views. The most well stocked kitchen I have ever seen in a vacation rental. Just perfect!! Despite cool and rainy weather, my daughter, daughter-in-law, two grandbabies and I had a wonderful short getaway. We knew the villa was top notch because we've stayed there twice before and it didn't disappoint. The beds were comfy, everything was clean and updated and the water pressure in the showers was awesome! The only possible negative is the uncomfortable deck furniture. It wasn't an issue this trip due to the weather but would be in warm weather. The automatic awnings are very convenient. We enjoyed a great week highlighted by a beautiful first night sunset. It is surprising how Seabrook and the angle of the property provide sunsets reflected across the water. The home was well appointed with a nice kitchen/living area. It was an easy walk up to the club with a couple attractive dining options. Very nicely appointed condo in perfect location for sunsets and beachwalks. From Grannie tio grand daughter - the perfect place to stay. Thank you very much for your recent stay with us! I am sorry we do not offer a remote for the awnings. There is a manual tool which opens and closes them . We had a wonderful time for the second year. Very peaceful and relaxing. Having spent lots of time on Seabrook in the last 10-12 years this is our favorite place to stay. Everything is as pictured or better. It was extremely clean and as someone who doesn't like to be away from home or travel much I felt very comfy and "at home". The kitchen was well equipped with quality cookware etc. The bathrooms were superb. 3 of the 4 had spacious walk in showers. Location was perfection. This property is great for adults and those looking for a quiet restful vacation. The first week of our stay we had 3 other adults and our 5 year old grandson. The gentle surf was just right for him. We saw dolphins many mornings and caught crabs for dinner. The porches with covered awnings were the best place to be morning, noon or sunset! Recommend renting bikes from Alligator and for a fantastic real Italian dinner (we are originally from Philadelphia area) dine at Wild Olive. Fresh fish, shrimp and veges at Rosebank Farms. Excellent Management Company! Go! You won't regret it. We stayed for the 4th time at this property and thoroughly enjoyed it. It has great views, is clean and wonderfully stocked. We took note that since our last stay, the owners replaced the dishwasher with a Bosch. Very nice touch. Fantastic condo. Great weather. Loved being on the beach. Very short walk to beach. We had a wonderful stay! Very comfortable and so clean and plenty of room and the best equipped kitchen awe have seen in our 20 years of vacationing at Seabrook Island. Our place was perfect. It had a beautiful view of the ocean and steps to the beach. We will definitely return. This was a super villa and super clean. The view is one that is etched in my mind until I can get back for a return visit. Seabrook Island is gorgeous even though we arrive several days after hurricane Matthew. We walked the beach took a kayak eco tour, spent one day in Charleston, and ate at several wonderful restaurants. Let me also add that the kitchen was equipped with plenty of pots and pans for cooking in which we did as well. We will diffidently be back!!!! One of our best weeks ever on the island, and have been coming here for over a decade. 6 of us (2 adults, 4 teens) plenty of space, awesome view, super clean, top notch location, unit looks brand new, and we have stayed here in past years, will always rent this unit in the future. Best Pelican Watch Villa there is. Seabrook Exclusives is the best agent. Sonnyboy Charters (Brad) is the best for charter fishing out of Bohicket. Comfortable and the great room allows us all to be together. The updated bathrooms and kitchen are wonderful and view is perfect. We will rent again ! My daughter was involved in a horrible boating accident on Feb 5, she went from the hospital straight to our rental on the beach, it was a relaxing and healing time for the whole family. Beautiful location. We enjoyed stay. We loved the property. It was clean, extremely well-provisioned, magnificently situated for maximum ocean views, and very comfortable. We made this trip with friends and we unanimously agreed we'd be coming back for another stay at this extraordinary property. Thank you for everything! Seabrook Island is becoming our home away from home. very nice. we will be back. Lovely vacation in Seabrook. It would have been nice to have a pool at Pelican Watch for those who don't like sitting on the beach. We have been down to Seabrook on many occassions, staying in this Villa. It always is the perfect vacation: Great location, view and beatiful inside. This beautifully decorated and outfitted villa made our vacation all the more special. We enjoyed our second annual stay at the Pelican Watch Villas in unit 1388. A spacious, well-appointed, comfortable home with great views and a quick walk to the beach. We will be back! This is our third year coming to Seabrook and it continues to amaze us. The unit was the best so far in location to the beach, size and comfort. My 7 year old is still raving on how great the week was. We had both Grandmothers with us this year, so my husband and I had some alone time. The unit was the perfect size for when all of us were inside together we weren't on top of each other. The access to the amenities was a plus. Having a new little one access to the smaller pools allowed her to experience the fun. We also took advantage of the horseback riding this year. You really get to see how beautiful the island is. The only negative I have is the cleanliness of the dishes wasn't so great. A lot of the glasses were still dirty with lipstick stains etc. but we didn't complain so much we just washed a load in the dishwasher. Overall we will definitely be back for another year and continue to make great vacation memories. Very clean home with great furnishings and household items. Lovely view from huge windows in great room. 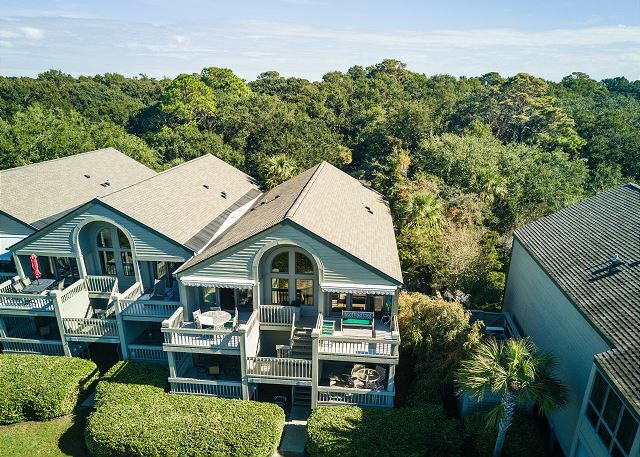 Convenient to Seabrook Clubhouse and restaurants. Wonderful balcony patio and breeze! A very pleasant experience. Condo was clean and well-appointed. It was a breeze to book and rental agency staff was very pleasant. Close to beach, clean, and nicely decorated :) The view was beautiful! Best view of beautiful sunsets from deck, overlooks joining of river and ocean, comfortable for 4 adults and as many as 4 young children. We've vacationed here for many years and like this villa best. Very nice. Any surprises were swiftly and pleasantly attended to. Very relaxing atmosphere to recharge one's batteries. We had a gathering of 10 adults from across the US. Along with our 2 condos and this one we had plenty of bedrooms and bathrooms. This was our "gathering place" and the dining room table for 10 people was fantastic! We would highly recommend this bright, open, well-designed and decorated condo to anyone! We enjoyed our third annual summer week at the beach at 1388 Pelican Watch. It's a great property, beautifully furnished and appointed with wonderful views of the water. You won't find anything better on the water. We had a wonderful girls weekend and the locaton and unit was beautiful.We loved being all together with incredible views and access to the beach. Three couples + 1 had a glorious week in this stunning condo! Beautiful, well stocked kitchen, three bedrooms/4 baths made everyone happy. And the view every morning was breathtaking! Absolutely will return! We have booked our vacation through Seabrook Exclusive for 10+ years and have never been disappointed. Once again, our experience was perfect. Condo was beautiful, clean, updated, comfortable with a great view and easy walk to the beach. It was wonderful! We love Seabrook! We will return many years to come! Great views to begin and end the day. Beautiful inside and out. A great Christmas with ALL of our family. A wonderful time was had and the condo and its location helped make it so. Overall, our stay was very pleasant. Couldn't have asked for better weather.The villa was quite nice and well decorated. The kitchen was adequately equipped; however, a large stock pot would be an extra bonus. The exterior of the building could use a good pressure washing, though. Quite a number of spiders and webs. Thanks Mr. Finnegan for your stay! I am sorry you didn't find the large crab pot. It is in the cabinet above the refrigerator. I have asked the association to do an exterior pressure wash. We look forward to assisting you with another stay in the future. Thanks again. We stayed for two weeks in July 2015- 8 of us- 3 kids and 4 adults. The kids loved the room with the trundle beds and there were plenty of bathrooms. One adult was on the coach bed, which is less than ideal but worked out. The front master room on the trundle bed side was always freezing cold while the other master was warm- couldn't regulate the A/C well. The sun also shines in the window of both master rooms even with the blinds closed so don't plan on sleeping late! The kitchen was well stocked and the appliances were great. The unit is close to the walkway to the beach. The beach is part river and part ocean- no waves to speak of for the kids to ride their boogie boards. Great sunsets as the unit faces west. We had the Sunday brunch at the club which was expensive, but yummy. We also visited Crave for breakfast and enjoyed it- nice mom and pop type place with fresh food and decent pricing. The kids enjoyed the fishing contest on Bohicket marina on Wed followed by ice cream! My family, comprised of 8 adults and 1 baby stayed here the first week of July and couldn't have been more pleased with the accomodations! 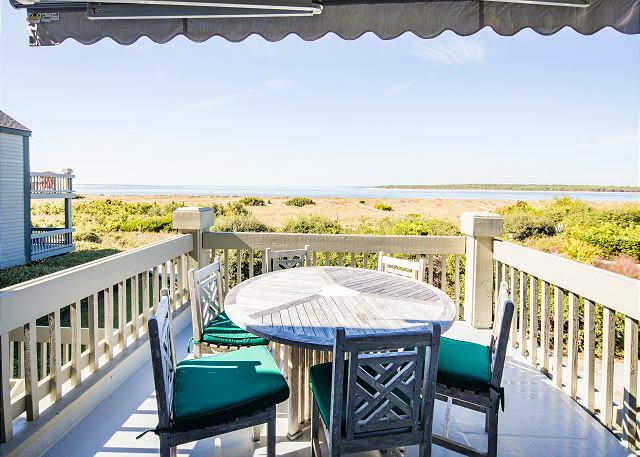 Beautifully decorated, plenty of room, well-equipped kitchen and easy beach access. This was our first visit to Seabrook and we will be back! The facility was great...very clean, nice decor and a beautiful view! We have vacationed in Seabrook for 15 years. This was the best equipped condo/house we have ever stayed in. It is just steps to the beach with beautiful views. Amazing place! 2 families shared this space and had plenty of room. The views were worth a million bucks. The home was fully stocked with utensils and serving pieces for entertaining. It is decorated beautifully. Weather and fellowship was spectacular! Unit is wonderfully equipped with an incredible view and easy access to all amenities. Sunsets from the decks were beautiful every night of our stay. The house is wonderful. Weill equipped and met every expectation. There description of the property was accurate leaving our family nothing to do but enjoy the surrounding community. The condition and location and decor of the villa were perfect! The 'state of the art' refrigerator was unhandy, with the freezer compartment drawers in the bottom, and had to remove a shelf to store tall items such as milk, tea pitchers, etc. The deck furniture was not comfortable for relaxing. Otherwise, everything was great - the beds, couches and chairs in living room were very comfortable, and plenty of technology (large flat screen TVs X 4, Bose stereo with Ipod capabilities, internet connection, dvd players, cable, etc.) if that's important. Overall a great experience - and we have been coming to Seabrook for 14 years, staying in a different villa each time - this was perhaps the nicest place we've stayed - at least in the top 5. Hope to get it again next year! The property was excellent in every way. Very updated, very clean, very organized (kitchen), very tastefully decorated, very refreshing and enviting to be in. It was a great experience staying at 1388 Pelican Watch. Already making plans to return. I have been a customer of Seabrook Exclusives for a couple of years now. They know me and what I desire in a vacation. They put forth a lot of effort to work with me and my difficult schedule. I always look forward to coming back to Seabrook Island and there is doubt that I will be using Seabrook Exclusive. Even when weather is not exactly what we would prefer, we had a fantastic time. However, the free wi-fi in the unit was extreamly slow, but we are very grateful it was available to us. Thank you for sharing your home with us.... We enjoyed it!! Golf Group. We used this unit for group gatherings. This was our first trip to Seabrook Island. We have been to Myrtle Beach, Destin and Gulf Shores many times but the do not even begin to compare with Seabrook Island. It is so beautiful. The beach was right outside our villa. Our entire family enjoyed walking, jogging and riding bicycles on the island. The condo appears to have been recently remodeled and it is stunning! We hated to leave and will definitely return to Seabrook and hopefully this villa in the future. First time on Seabrook and absolutely loved it. Very spacious, beautiful condo, great location! Not sure about needing amenity card to eat at the Pelican's Nest. The only negative was the construction going on in the unit directly below us. While the hours of construction were during the daytime, given the cost of the rental, I would not have expected to hear hammering, saws, etc. during our stay. A lovely condo. I would highly recommend it. Boy excursions. Everyone was friendly and accomodating. I'm positive that we will be back soon! The condo was well appointed and comfortable. The ocean view was very nice. We took several pictures of the sunset. We are very happy with our rental experience and would recommend this unit. This was a delightful villa, bright, clean and not overly beachy in decor. Having previously owned an island home in the area myself, I know the area well. I chose to rent from a respected property management company because I was looking for quality. The agent that I worked with recommended this villa and I was so very pleased with her recommendation. My guests had never been to the Charleston area and found Seabrook provided much more than their expectations. The villa itself spoke to our need for relaxation and spaces to "gather", while still providing privacy. Sunsets from the balcony left a lasting impression, we will return next fall. We've come to Seabrook or Kiawah Island for 27 years. The last 8 or so have been at only Seabrook because of the Pelican Watch area and its gorgeous sunsets, quick access to the beach, and tranquility. The unite we rented this time was by far the nicest of all. First time we have rented from Pam Harrington. Experience was perfect. Easy to set-up and then a beautifully appointed unit with fanastic views. I am sure I will rent this one again. This villa is beautiful and in the perfect spot. We have stayed at many places on Seabrook and this was one of our favorites. It was such a short walk to the beach and the villa's views were breathtaking. The villa's decor was gorgeous and comfortable and as a cook I found everything I needed. We would book this villa again in a heartbeat. The unit was very clean and beautifully decorated. The kitchen was well stocked with dishes, serving bowls and cooking utensils. The view of the beach was fabulous. Seeing deer and sea turtles on the beach and yard was wonderful. The rental staff were very friendly. Overall an awesome vacation experience. We'll definitely be back!